Psoriasis is an inflammatory disease that can affect the skin and joints and is characterized by a chronic or recurrent course. The severity and progression are very different. Psoriasis is chronic and episodic. 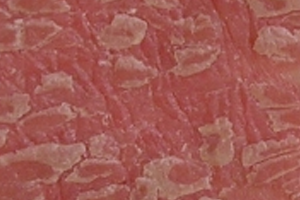 Clinically, there are either sharply demarcated, erythematous, covered with silvery scales plaques at typical locations (head, elbows, knees, coccyx), or it always comes back with a scaly, erythematous spots, partially over the body or with generalized redness and scaling of the entire skin (erythroderma). Psoriasis is strongly provoked by mechanical irritation (“Köbnerphänomen”), by infections, climate (worse in winter, better in summer), through mental stress and alcohol. Depending on the severity, a local therapy is sufficient. 1 cortisone ointments are useful in acute attacks at the beginning, in long-term treatment, they do not bring healing . 3 Tar preparations are very effective, but are smelly and lead to a laundry pollution. The UVB light therapy or enhanced UVA light therapy provide highly effective treatment for extensive skin involvement. In UVA light therapy, the sensitivity to light is previously raised by local or internal use of psoralens (light sensitivity amplifiers of grasses). It needs frequent treatments (15-20) at short intervals (2-3 days) are required. The best results of light treatment can be found with a so- 311nm narrowband UVB light therapy. It shows all the best effects and the least side effects, such as redness, sun belt or long-term sun damage. The treatment is performed 3-5 times per week, each with very short exposure times. If the extent of the body surface that is covered is high a systemic therapy is necessaryFurther in severe cases immunosuppressants such as Methotrexate, Cyclosporine or Acitretin can be used. The Biologics is a new generation of drugs for the treatment of psoriasis that are better tolerated. The selection and use of an appropriate one in individual cases, it requires experience and a careful evaluation of risk factors (infections) and comorbidities (accompanying diseases) such as arthritis, obesity, cardiovascular disease, alcoholism and depression. The psoriasis is still not curable, so treatments are used for controlling of its activity, to significantly improve the quality of life and working ability of those affected. Naturopathic Treatment: Due to the extremely chronic, often lifelong course of the disease, some naturopathic treatments (dietary therapy, homeopathy) have proven very helpful.